I'm telling you, I really think something amazing is going on. 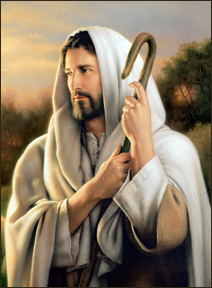 It started about thirty years ago, when a bunch of us were working the night shift, and angels told us about the birth of the Messiah. Yeah, I know, I know -- I've told that story a lot of times already. But guys, I was there -- I know what I saw. And I was starting to believe that God was finally up to something, after four hundred years of silence... well, who wouldn't get excited about that? And then -- nothing. No further word. No more angels (at least, none that I saw, anyway). Back to the silence. Okay, I know what you're thinking -- I can see it in your eyes. You've heard this Scripture a thousand times before. We've all heard it since we were kids at the synagogue -- God will give us a shepherd like David... blah, blah, blah. So why should last Sabbath be any different? Well, stand still a minute and listen! Because not two days after the Sabbath, I was in town, and I saw this new rabbi in some kind of heated debate with the Pharisees (what else is new with our grumpy spiritual leaders, eh?). Well, I couldn't help but overhear their conversation, and guess what this new rabbi is saying?!? What proof, you ask? What makes this rabbi any different than the rest? 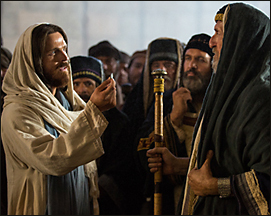 Well, for one thing, He had just healed a guy who had been blind from birth (John 9). That sure got everyone's attention! Luke Geraty, pastor of Trinity Christian Fellowship and the brains behind ThinkTheology.org, has written a great review for The Genesis Cafe: Conversations on the Kingdom. 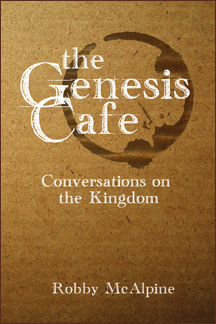 Luke and I have enjoyed many conversations, debates, and camaraderie over the past couple of years, and I am grateful for him taking the time to review one of my books. Ten years ago, as our family was in the midst of a move back to British Columbia, we picked up an unusual traveling companion. A 12-week-old kitten showed up on my mother-in-law's front porch in Manitoba, dragging a mangled hind leg behind it. Turns out that it had been one of three kittens who thought that sleeping inside a warm hay-baling machine was a good idea. Only one of the kittens survived that ill-advised choice, and he was pretty messed up when our kids found him on the porch. We took him into Winnipeg with us, and a local vet amputated the crushed and necrotic remains of his hind leg. We named him "Tripod", put a cone on his head to keep him from messing with his stitches, and continued on our journey west. 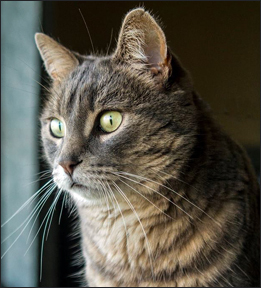 For the past ten years, Tripod has been one of the craziest personalities in a house full of eccentric pets and people. He didn't seem to realize that he was technically handicapped, and pursued all the normal cat sort of things with vim and vigor. He was cuddly, demanding, warm, imperious, friendly, and a cunning nemesis for all local vermin. That cat slept through more football and hockey games than I could count, curled up purring in my lap. He entertained many guests, and became an ingrained part of the local community when we lived in Tijuana, Mexico: perched in his window box overlooking the street, keeping an imperial eye on his domain and his subjects as they walked past, waving and calling out greetings. It's amazing how pets become part of your family. Cats are supposed to be aloof and smugly disdainful of mere humans. Tripod didn't get the memo, apparently, and made friends with whoever came within reach of his plush fur and soporific purr. It's never easy when it comes time for that one final trip to the veterinarian's clinic. And today was the day. Good-bye, Tripod. There will always be a spot on the hearth and in our hearts that will belong to you. The first couple of times it happened to us, we were confused and perplexed. 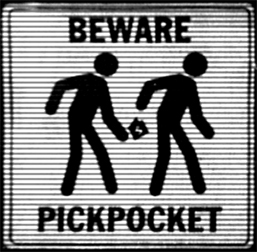 But eventually, even slow learners like me can catch on to the back-handed confirmation of the Pick-pocket. Whenever Wendy and I have felt like God was prompting us to take some faith-risks, we almost always experience some kind of financial smack-down that makes it look like we should have played it safe. 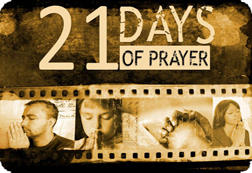 Just a few months ago, The Well -- the church we've been attending for several years, and where I was on part-time staff as worship director -- called for 21 days of prayer about the church's vision and future. A prayer room was set up in our pastor's house, and people could gather -- individually or in groups -- at all times of the day and night to pray about the church. Wendy & I will miss the weekly gatherings with our friends at The Well, although BBQ's will undoubtably help us stay connected with a pretty cool bunch of people. We said our good-byes on the final Sunday of January, less than two weeks ago. Leaving The Well also means a reduction in our finances, obviously. But when you are convinced God is leading, that's not an obstacle that you allow to influence your decision-making. And within a week, the Pick-pocket was back at it, and suddenly we were unexpectedly faced with expensive car repairs. With more on the horizon. Step out in obedience (faith-risk). Smile & accept the back-handed confirmation. And as the inscription on the stone reminds us, God has been faithful this far. And so, we have confidence that He will continue to bring us along. Even when we have no freakin' idea what He's up to. 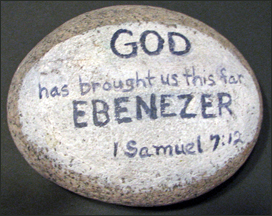 When we first moved to Winnipeg, oh so many years ago, Wendy placed a stone with the word "Ebenezer" written on it in our kitchen window. Every time we did the dishes, it quietly reminded us to continue to trust, even when -- maybe especially when -- we couldn't see the path before us. So for now, we recognize the back-handed confirmation, remember the significance of the Ebenezer stone, and trust.